At Southern Illinois University Edwardsville, hands-on learning, interdisciplinary collaboration, faculty scholarship and student research opportunities are high priorities in the preparation of students who will shape a changing world. A research project led by Sarah Conoyer, PhD, assistant professor in the School of Education, Health and Human Behavior’s Department of Psychology, is hitting all of those marks, and when complete will positively impact teacher assessment of students with learning disabilities. “We’re developing a technology-based formative assessment system for monitoring the science language acquisition of students with learning disabilities,” Conoyer explained. “Students who struggle with word knowledge may have a hard time engaging with science content and activities. This can hinder their learning and interest in science and potentially impact their access to STEM education and related careers. “The Progress Assessment of Science and Academic Language (PASCAL) System we’re creating will provide teachers with regular feedback on their students’ performance in foundational science concept terminology and vocabulary,” she added. The idea for the assessment tool was developed through Conoyer’s collaboration with Nathan Clemens, PhD at The University of Texas. Several SIUE students are contributing to the project, with expected completion of initial software targeted for April. Additionally, Mark McKenney, PhD, associate professor of computer science, is a project consultant. A team of three computer science students are working with Conoyer as their senior assignment under the supervision of Gary Mayer, PhD, assistant professor of computer science. Bradley Peradotto, of Pinckneyville, Tyler Simpson, of St. Louis, and Brendan Shelton, of Edwardsville, have assisted in software creation, including determining which tools, programming languages and platforms would be best for the project and developing the software. Fellow undergraduates in psychology are working to develop science terms and definitions related to students’ grade level and the Next Generation Science Standards. Contributors include Shelbi Simmons, of Granite City, and Undergraduate Research and Creative Activities (URCA) assistants Jennifer Robbins, of Bunker Hill, Gabrielle Ellis, of Hazelwood, Mo., Nicole Ties, of Elizabeth, and DeAnna Scully, of Belleville. Graduate student Rachel Romano is also involved. Having earned a master’s in clinical child and school psychology from SIUE in December, she is now pursuing a specialist degree in school psychology. According to Conoyer, her receipt of an SIUE STEP grant totaling $15,996 for FY19 will further advance her scholarship and teaching by supporting the continued design, development and implementation of the PASCAL system. 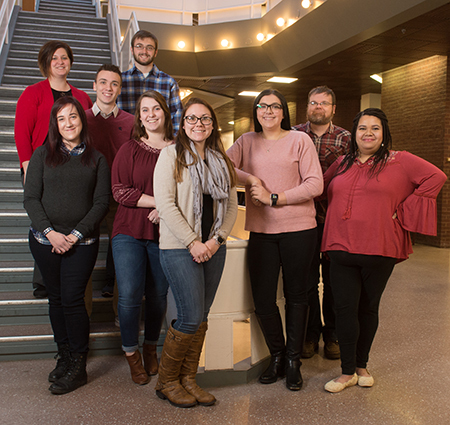 Photo: SIUE’s Dr. Sarah Conoyer (far left) stands with student researchers (L-R) Shelbi Simmons, Brenden Shelton, Tyler Simpson, Jennifer Robbins, DeAnna Scully, Nicole Ties, Bradley Peradotto and Gabrielle Ellis.